My clinical experience is that in America, when people die from cancer, they are NOT actually dying from cancer, but instead, they are dying from the medical TREATMENT itself. They are dying from the chemotherapy, radiation and surgery. AGAIN: They are NOT dying from the cancer—they are being killed by the medical doctors and their medical treatment! ---Richard Shulze, N.D., M.H. .The bottom line is for a few kinds of cancer chemo is a life extending procedure---Hodgkin's disease, Acute Lymphocytic Leukemia (ALL), Testicular cancer, and Choriocarcinoma." 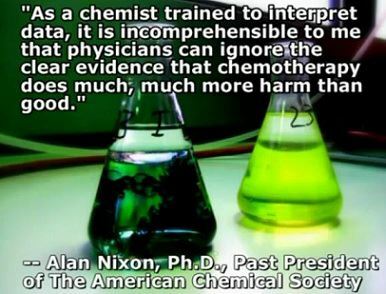 ----Ralph Moss, Ph.D. 1995 Author of Questioning Chemotherapy. The New England Journal of Medicine Reports War on Cancer Is a Failure: Despite $30 billion spent on research and treatments since 1970, cancer remains "undefeated," with a death rate not lower but 6% higher in 1997 than 1970, stated John C. Bailar III, M.D., Ph.D., and Heather L. Gornik, M.H.S., both of the Department of Health Studies at the University of Chicago in Illinois. "The war against cancer is far from over," stated Dr. Bailar. "The effect of new treatments for cancer on mortality has been largely disappointing." .chemotherapys success record is dismal. It can achieve remissions in about 7% of all human cancers; for an additional 15% of cases, survival can be "prolonged" beyond the point at which death would be expected without treatment. This type of survival is not the same as a cure or even restored quality of life. "John Diamond, M.D. "Keep in mind that the 5 year mark is still used as the official guideline for "cure" by mainstream oncologists. Statistically, the 5 year cure makes chemotherapy look good for certain kinds of cancer, but when you follow cancer patients beyond 5 years, the reality often shifts in a dramatic way."Diamond. Women with breast cancer are likely to die faster with chemo than without it. "Alan Levin, M.D. More women with mild or benign diseases are being included in statistics and reported as being "cured". When government officials point to survival figures and say they are winning the war against cancer they are using those survival rates improperly." ---Dr J. Bailer, New England Journal of Medicine (Dr Bailers answer to questions put by Neal Barnard MD of the Physicians Committee For Responsible Medicine and published in PCRM Update, sept/oct 1990.